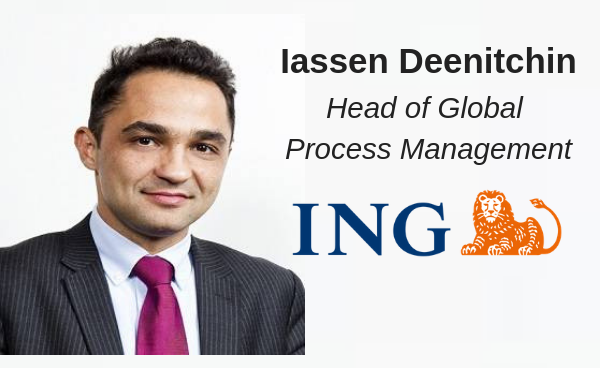 We are proud to announce one of our keynotes at Business Transformation & Operational Excellence World Summit & Industry Awards (BTOES19) is Iassen Deenitchin, Head of Global Process Management at ING. RPA is one of many levers for improving processes and operational performance. Yet, it often lives its own life in large organizations: from the organizational set-up and resources to identifying and capturing opportunities for process optimization. Substantial value can be created from integrating RPA into end-to-end process management; and leveraging it fully to enhance customer experience and improve efficiency. Iassen is Head of Global Process Management at ING. He joined the global banking group in 2016, with the aim to support the execution of the Accelerate Think Forward strategy through a common process management and improvement practice centred around the customer. Prior to that, Iassen was Head of Lean and Process Management at Raiffeisenbank International and an Associate Principal at McKinsey & Company. He holds an MSc in Financial Economics from the Norwegian School of Management and an MBA from the Kellogg School of Management, Northwestern University. ING (International Netherlands Group) is a Dutch multinational banking and financial services corporation headquartered in Amsterdam, the Netherlands. Its primary businesses comprises retail banking, direct banking, commercial banking, investment banking, asset management, and insurance services. The orange lion on ING's logo alludes to the Group's Dutch origins under the House of Orange-Nassau. ING is the Dutch member of the Inter-Alpha Group of Banks, a cooperative consortium of 11 prominent European banks.